The order picking operation is a logistic warehouse’s process. It consists of taking and collecting items / articles in a specified quantity before shipment to satisfy customers’ orders. 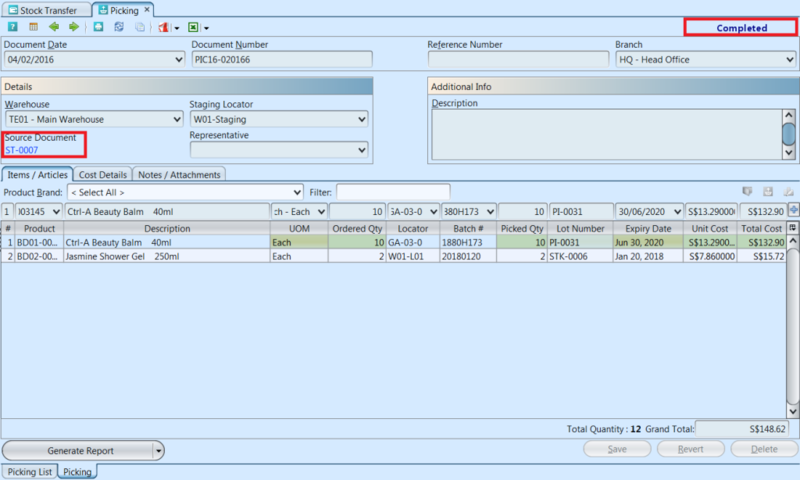 GOOMI’s Picking application allows user to manage the picking documents of inventory of all the delivery confirmations. Once the (sales) delivery order has been confirm the next step would be the picking process. Picking in GOOMI also support other processes like “Debit Note”, “Stock Transfer”, “Stock Adjustment”, “UOM Conversion” and more. 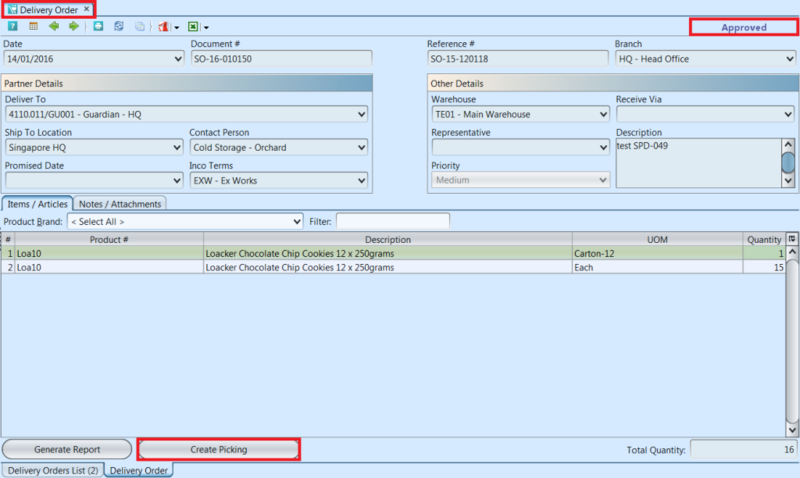 On some of the documents listed above, user will see “Create Picking” button at the bottom left of screen to generate Picking, after the document approval / posting. Some of the other documents listed above will generate Picking when the document is confirmed. A link to the corresponding Picking document will then be created at the bottom left corner of the document. 2. 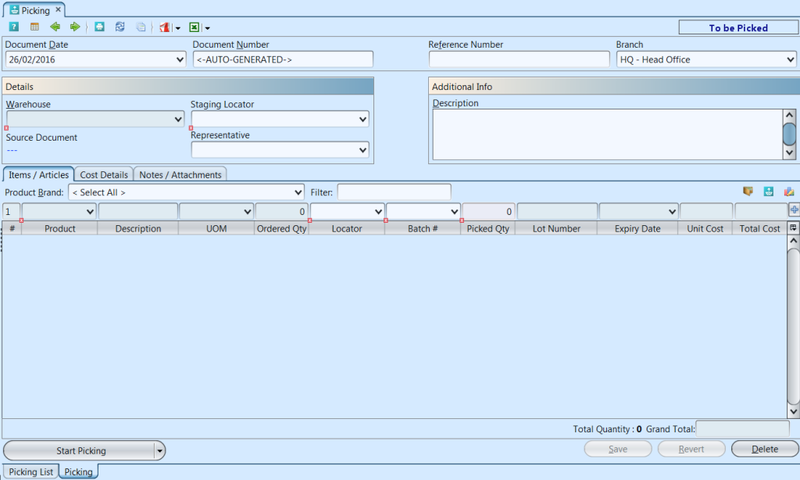 In Sales Order and Sales Proforma Invoice, the system will reserve product batch according to the Product’s picking method (i.e. 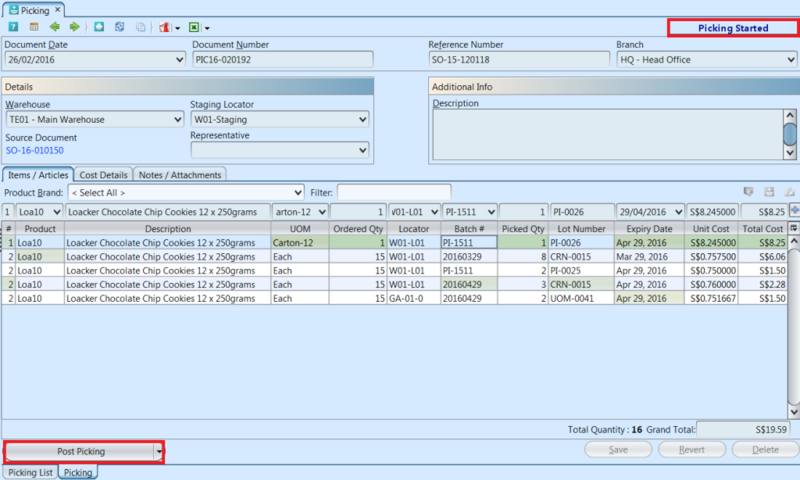 FIFO, LIFO, or FEFO) after the Sales Order / Proforma Sales Invoice document was confirmed. User will still be able to make changes to the Picking line items, if required, to be different from the line items generated by the system. 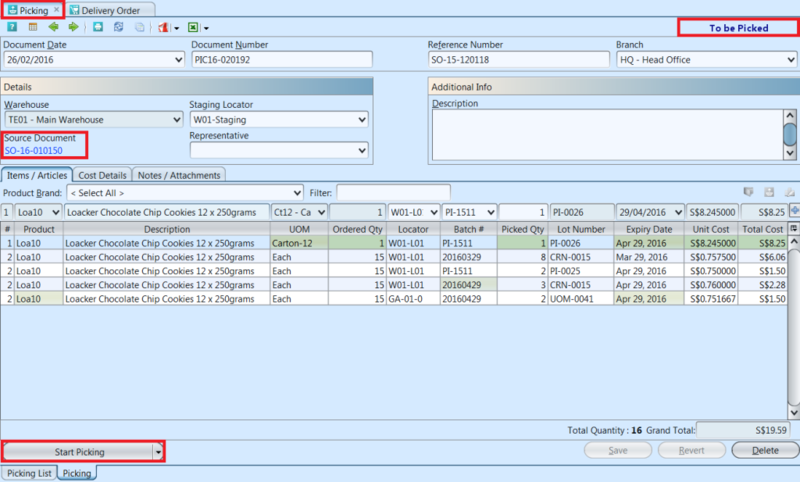 For the line items, user is able to select a different locator, batch #, and even change the quantity to be pick from a certain batch (i.e. split the quantity to be from different locators / batches)*. The first icon allows user to pick all products from a selected locator. The second icon allows user to pick all products from a selected lot. The third icon allows user to regenerate the picking list, as picked by the system according to the picking method set for each product. 3. Click on “Notes / Attachments” tab at the middle of screen to write more information, attached photos, upload file, or remove the attached contents. 7. For most outbound process, i.e. 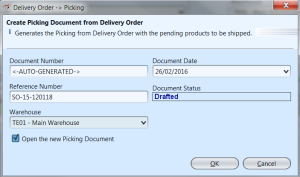 Sales Order, Packing document will be generated after posting of the Picking document. A link to “Show Packing” will be added at the bottom left of the screen. For other logistic processes, i.e. Stock Transfer, user will be required to go back to the source document and complete the process, that is to post the source document etc. 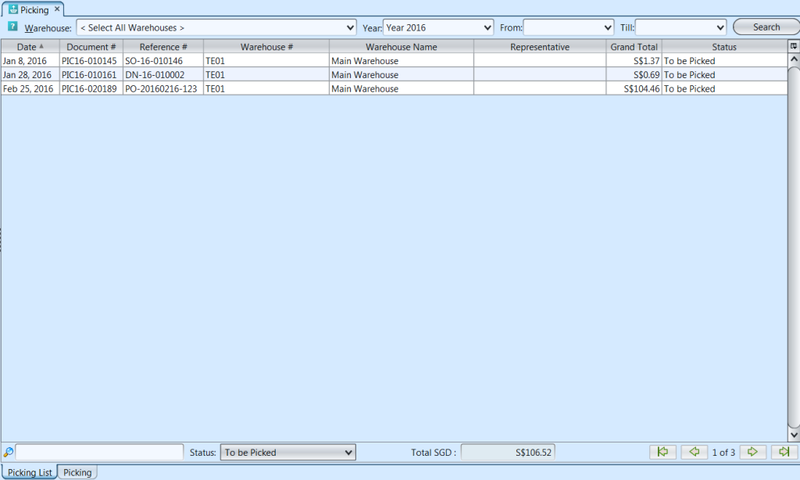 Note: user may process multiple documents in the list view, by selecting more than 1 row and then right-click the mouse button. 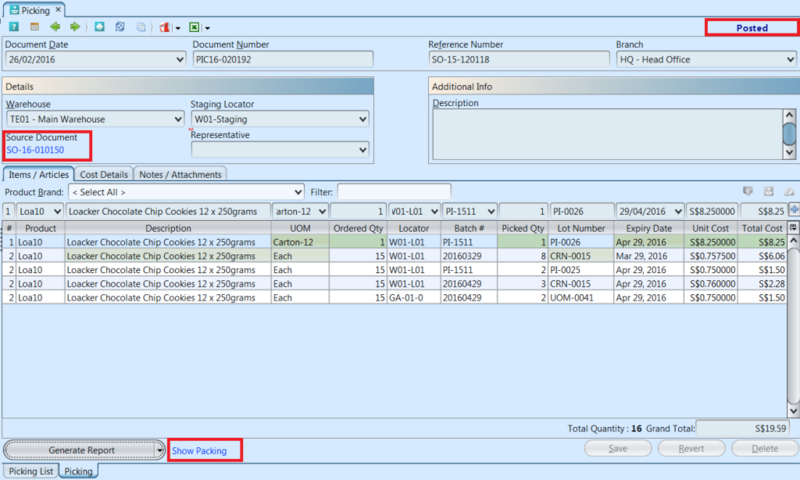 A list of options will be shown to user, choose an option to process the selected multiple documents.